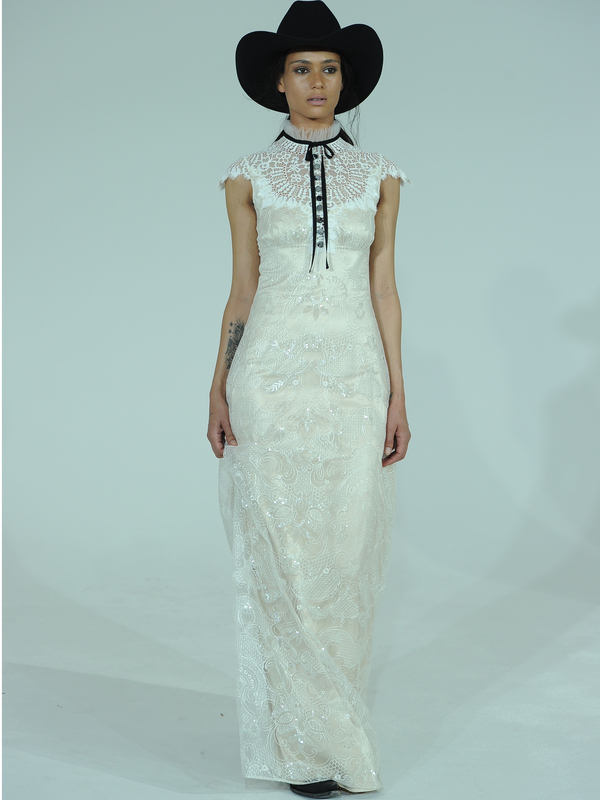 See wedding dress designer Claire Pettibone's romantic, prairie-inspired looks from her spring 2016 Bridal Fashion Week runway show. 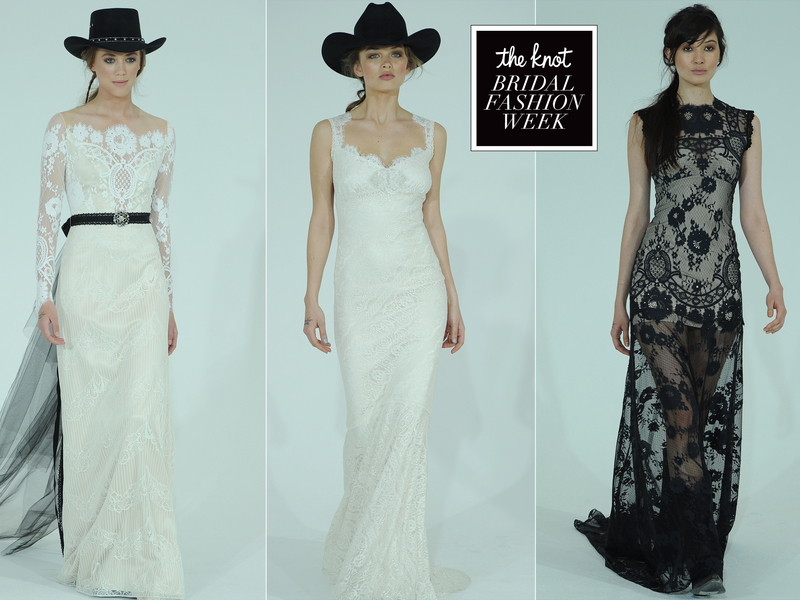 Claire Pettibone showed us just how the West was won -- with plenty of vintage lace, pioneer style and bandit black details. Her romantic Spring 2016 collection took our breath away. The designer juxtaposed rustic Old West-style accessories, like cowboy hats and boots, with delicate wedding dresses featuring high necklines, scalloped edges, shirred lace and unexpected black tulle accents. "I was honestly inspired by my brides," Pettibone tells The Knot. "I have a lot of girls who get married in this type of setting, or have this type of vibe." She cites O Pioneers!, a classic novel by Willa Cather, as an influencer, as well as finding the beauty in a natural landscape. "My father has a house in upstate New York, which has dairy farms and wheat fields. It's very rural, and I thought it was great design inspiration for a collection," she says. "I've never done anything like it before, and I like to keep things fresh and exciting." There was a lot of lace on the runway, and Pettibone is all about fabrics and special embroidery, as evidenced in the romantic champagne and ivory lace sleeves, high necklines and gathered collars in her collection. "I loved working with the high necklines and details on the backs -- one of my favorite spots -- and sleeves. For the most part, the dress is going to be lined, but the lace is so beautiful against the skin, so this gives an opportunity to see that detail with yokes and embroidery." She even has two stand-out black lace wedding dresses with champagne lining in her collection! As for all the black accessories? They're "a little twist to the sweetness and lace," Pettibone says, adding that they give a little edge to the romantic, feminine looks. "I'm not a cookie cutter kind of girl, so I like to offer brides something different, something that I hope is timeless and something that expresses who they are." See some looks from the collection below.